WETHERALL, Sir GEORGE AUGUSTUS, soldier; b. in 1788 at Penton, Hampshire, England, only son of General Sir Frederick Augustus Wetherall, and his first wife, Elizabeth Mytton; m. Frances Diana Denton in 1812; d. 8 April 1868 at Sandhurst, England. 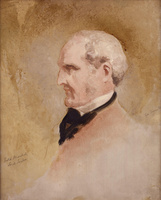 George Augustus Wetherall attended Hyde Abbey School, Winchester, and the military college at Farnham. At age seven lie was already an officer, having been provided on 29 July 1795 with a lieutenant’s commission in the 7th Fusiliers. His active service began in Halifax in 1803 when he joined his father’s newly raised Nova Scotia Regiment of Fencible Infantry. Promoted captain on 13 May 1805, he exchanged to the 1st Foot (the Royals), then serving in the West Indies, on 27 Nov. 1806. Captain Wetherall joined his father’s staff as brigade-major at the Cape of Good Hope in 1809. He served his father as aide-de-camp during the conquest of Java in 1811, and became a major in his regiment in December 1819. From 1822 to 1826 he was military secretary to the governor of Madras, then became deputy judge advocate general for India. On 7 Aug. 1828, he was promoted lieutenant-colonel in the Royals. He commanded the Royals’ 2nd battalion in Madras until 1831, then in the United Kingdom, 1831–36, and in Canada, 1836–43. 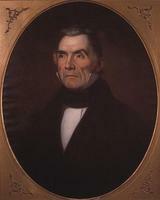 During the early autumn of 1837 Wetherall was in command of the Montreal garrison but returned to regimental duty on 1 November. The city was already tense as increasing bitterness between the adherents of Louis-Joseph Papineau* and his Patriote movement and the supporters of the government threatened open strife. 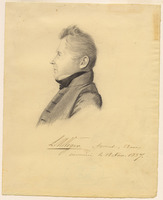 On the 16th warrants were issued against Papineau and 25 of his leading supporters including Dr Wolfred Nelson. Most had fled the city, but the military could now act legally in support of the civil power. When, that night, a troop of Royal Montreal Cavalry with Patriote prisoners was set upon near Longueuil by armed men, political defiance had, in the eyes of many, become rebellion. Wetherall was one of the first senior officers affected. Early on the 18th, with four companies of his own battalion, a detachment of artillery with two guns, some troopers of the Royal Montreal Cavalry, representatives of the magistrates, and a volunteer, Major Bartholomew-Conrad-Augustus Gugy*, provincial assistant quartermaster-general, he left Montreal with instructions to proceed to Fort Chambly on the left bank of the Richelieu. Meanwhile the commander of the forces, Sir John Colborne, was completing plans for a pincer movement against Saint-Denis and Saint-Charles. These villages were, respectively, the headquarters of Nelson, one of Papineau’s ablest lieutenants, and of Thomas Storrow Brown*, the “general” recently appointed by Montreal’s Patriote club, the Fils de la Liberté. Colonel Charles Stephen Gore, the deputy quartermaster-general for British North America, was to command the expedition, attacking south from Sorel against Saint-Denis, while Wetherall marched north against Saint-Charles. Violent weather and the vigilance of Patriote scouts seriously hampered Colborne’s communications with his field commanders. The two forces, however, did set off for this concerted attack as planned. The road which Wetherall, who was now reinforced by a company of the 66th, proceeded to take to Saint-Charles had been reduced to a treacherous morass by the first heavy rains of the winter and bridges had been cut; Wetherall’s column had only marched half way, to Saint-Hilaire (Mont-Saint-Hilaire), by daybreak on the 23rd. Word of Gore’s defeat reached Saint-Hilaire near midnight, leading Wetherall to believe he might have to face as many as 3,000 Patriotes at Saint-Charles. No orders came to him. Early on the 25th his force, now some 350 strong with the addition of a reserve company of the Royals, was en route to Saint-Charles. Thomas Storrow Brown, who had spent the preceding week terrorizing loyalists and confiscating grain, cattle, and weapons, had grossly neglected the defences of his stronghold in the village. Moreover, Brown’s force had melted away, and he was left with perhaps 100 muskets and a few score of men armed with the most primitive weapons. Wetherall halted out of range of the barricade Brown had erected and sent a prisoner forward with a message stating that government forces were en route to Saint-Denis and that there would be no injuries or reprisals if they were given peaceful passage through Saint-Charles. Brown, now both desperate and confused, finally replied that free passage would be granted if the British laid their arms along the roadside. Meanwhile Wetherall, his patience exhausted, had advanced to the barricade hoping for the appearance of either a white flag or a messenger. He was greeted with a fusillade. His guns now tore great holes in the barricade and he ordered a charge; the Patriotes fought bravely, but the affair was over within the hour. Brown fled north towards Saint-Denis early in the action. The British, with three dead and 18 wounded, counted 56 Patriote bodies, and suspected that many others had been killed. Mopping up continued throughout the 26th. Many houses had been fired during the battle, and those that had sheltered sharpshooters, whether owned by Patriotes or loyalists who had fled, were burned the following day. On the 30th Wetherall entered Montreal in triumph with 30 prisoners and the Liberty Pole of Saint-Charles, complete with its red cap. With the Richelieu district under control, Colborne turned his attention to Saint-Eustache, some 18 miles northwest of Montreal, from which the Patriote leaders Amury Girod* and Dr Jean-Olivier Chénier* controlled much of the rich farming country north of Lac-des-Deux-Montagnes. Colborne set out from Montreal on 13 December with nearly 2,000 men in two brigades commanded by lieutenant-colonels John Maitland of the 32nd and Wetherall of the Royals, a strong detachment of artillery, and some volunteer cavalry, and the Montreal Volunteer Rifle Corps. They reached Saint-Eustache before noon on the 14th. Colborne first directed his guns against a group of large stone houses. Wetherall, not long after, was ordered to advance down the main street and attack the Patriote citadel: the church, presbytery, and convent. Chénier’s position (Girod had fled early in the action) was desperate; although some 1,000 Patriotes had paraded on the 13th, he had now only 200 or so effectives, 70 or 80 of whom garrisoned the church. Wetherall’s guns had little impact on the church, and the British infantry was hampered by the Patriotes’ deadly fire. Finally Colonel Wetherall’s son, Lieutenant Edward Robert Wetherall of the Royals, broke into and fired the presbytery, then the church; the convent had been earlier put to the torch. It was now killing time. Desperate men fleeing from the church had little chance to save themselves. By 5 p.m. Dr Chénier and 70 of his men had been killed, and 118 were taken prisoner. The British and volunteer losses were negligible: one killed, nine wounded. That night the lootings and burnings of Saint-Denis and Saint-Charles were repeated, but on a larger scale. The troops, especially those of the 32nd, were bent on avenging the death of their comrade, Lieutenant George Weir, murdered at Saint-Denis on 23 November [see Gore], and the volunteers had many a score to settle with the Patriotes. Some 60 to 70 houses in addition to the religious buildings were destroyed. 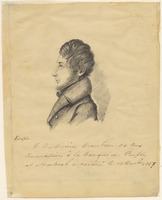 There is no evidence that Wetherall played any part in this aftermath and on the 17th he returned to Montreal with Colborne, who was satisfied that at Saint-Eustache the back of the rebellion had been broken. On 13 June 1838 Wetherall received the cb and on 28 June a brevet-colonelcy in recognition of his services. Four years later he was appointed adc to the Queen. 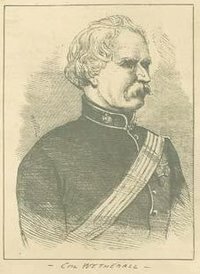 Wetherall commanded the garrison in Canada West at London from 1840 to mid 1843, when he returned to Montreal as deputy adjutant-general. In June 1850 he was recalled to England to become deputy assistant quartermaster-general at the War Office. Promoted major-general in 1851, Wetherall became adjutant-general in December 1854, and general in October 1863. He received a kcb in 1856, and the gcb in 1865. From 1860 to 1865 he commanded the Northern District of Britain’s Home Command. His last appointment, in 1866, was to the governorship of the Royal Military College, Sandhurst. Sir George Augustus Wetherall was unquestionably a soldier of outstanding merit, one of the few British officers who served in North America to achieve a dominant post in the upper echelon of control at the War Office. As an individual he was both popular and respected. PRO, WO 17/1540–54 (mfm. at PAC). Gentleman’s Magazine, CCXXIV (January-May 1868), 690. Montreal Gazette, 28 Nov.–16 Dec. 1837. Boase, Modern English biog., III, 1291. DNB. G.B., WO, Army list, 1795–1839. Hart’s army list, 1840–68. The regimental records of the Royal Scots, comp. J. C. Leask and H. M. McCance (Dublin, 1915), 421–26. L.-..N. Carrier, Les événements de 1837–1838 (Québec, 1877), 78–82, 91–92. Christie, History of L.C., V, 2–9. [C.-.A.-.M. Globensky], La rébellion de 1837 à Saint-Eustache précédé d’un exposé de la situation politique du Bas-Canada depuis la cession (Québec, 1883). 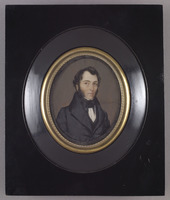 Joseph Schull, Rebellion: the rising in French Canada, 1837 (Toronto, 1971), 63–64, 78–84, 113–23. J. H. Stocqueler [J. H. Siddons], A personal history of the Horse-Guards, from 1750 to 1872 (London, 1873), 251–52. H. S. Thomas, The story of Sandhurst (London, 1961), 119. John W. Spurr, “WETHERALL, Sir GEORGE AUGUSTUS,” in Dictionary of Canadian Biography, vol. 9, University of Toronto/Université Laval, 2003–, accessed April 26, 2019, http://www.biographi.ca/en/bio/wetherall_george_augustus_9E.html.